For years, streusel-topped, buttery blueberry muffins have been calling out to you in the latte line. Take a bite out of your urges with the White Chocolate Blueberry Muffin Quest Bar, full of succulent berries and chewy cobbler inclusions. With 21g of protein and 5g net carbs, this bar is a #CheatClean stud muffin. Every delicious Quest Bar flavour has 20-21 grams of protein and plenty of fibre without a lot of unnecessary ingredients or extra carbs. All Quest Bars are gluten and soy free, and contain no added sugars*. Quest Bars are helping us inspire a global #CheatClean revolution, reframing the conversation around nutrition. This is the bar that promises food can taste as good as it is good for you. With Quest Bars, you can eat toward your goals and love every bite along the way. *Trivial amount of naturally occuring sugars from different ingredients. Protein Blend [Milk Protein Isolate, Whey Protein Isolate (Milk)], Soluble Corn Fibre, Almonds, Water, Graham Crackers (8%) [Protein Blend (Milk Protein Isolate, Whey Protein Isolate (Milk)), Soluble Corn Fibre, Cocoa Butter, Flavourings, Cinnamon, Sea Salt, Thickeners (Cellulose Gum, Xanthan Gum), Raising Agent (Baking Soda), Sweeteners (Sucralose)], White Chocolate Flavour Chunks (6%) [Cocoa Butter, Milk Protein Isolate, Bulking Agent (Erythritol), Flavourings, Sea Salt, Sweeteners (Sucralose, Steviol Glycosides)], Dried Blueberries (3%), Bulking Agent (Erythritol), Flavourings, Sea Salt, Sweeteners (Sucralose, Steviol Glycosides). 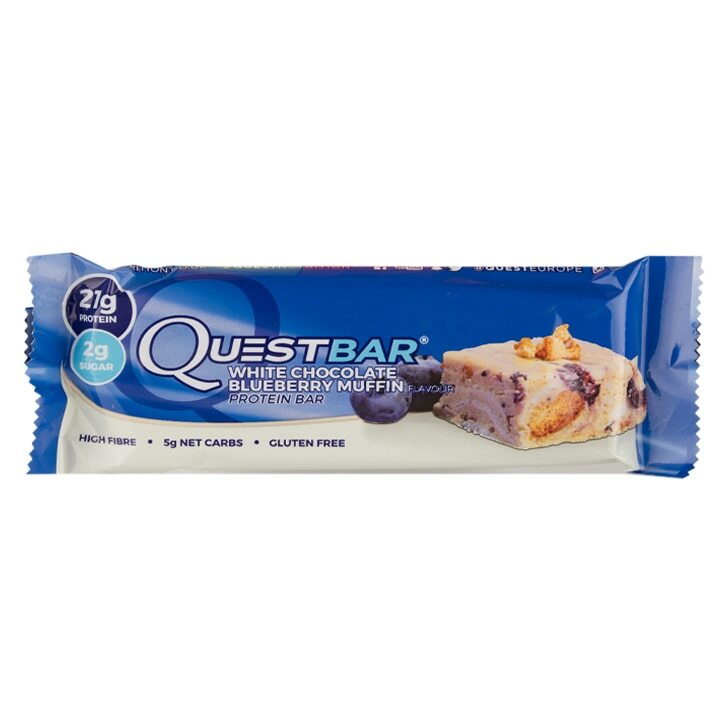 Quest Protein Bar Blueberry Muffin is rated 4.0 out of 5 by 2. Rated 4 out of 5 by Karen1958 from Good for lunches at work On a low carb diet saw this on a low carb website thought I’d give it a try. The only downside for me is they contain artificial sweeteners.